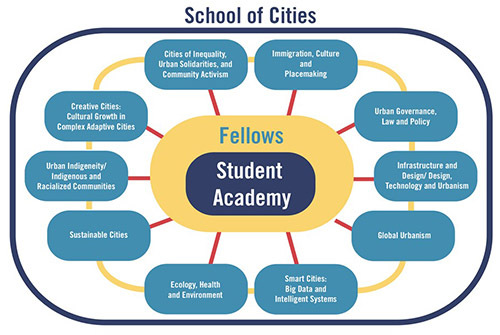 The School of Cities Student Academy is a tri-campus interdisciplinary academic platform to foster student academic and social engagement and leadership in city-building and urban scholarship. It is a student-led intellectual hub for undergraduate and graduate students’ collaborative learning and professional development, and their pursuit of critical and ethical analysis of complex urban challenges and urban education in the Greater Toronto Area, Canada and globally. The School also offers U of T Student Fellowships and non-stipendiary International Visiting Postdoctoral Fellowships to international scholars working on cutting-edge urban-focused research projects.